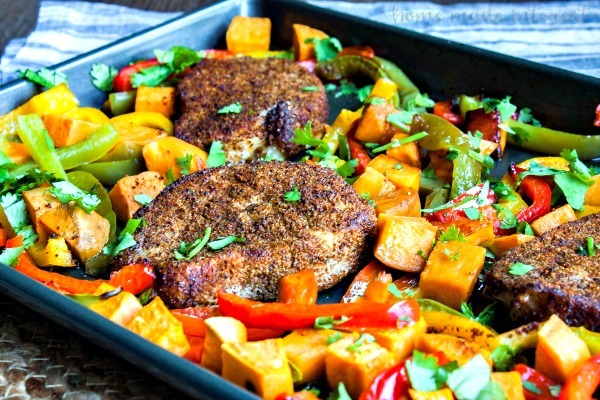 Sheet Pan Spicy Pork Chops and Sweet Potatoes - Home. Made. Interest. 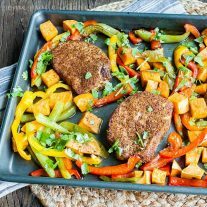 This Sheet Pan Spicy Pork Chops and Sweet Potatoes dish is full of big flavors and makes a bright and beautiful weeknight dinner. I’m kind of in love with sheet pan meals right now. 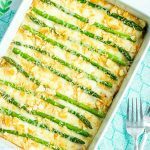 They make getting dinner on the table during a busy week so easy! I’ve been trying all sorts of combinations of meats and vegetables, and so far I’ve loved them all. 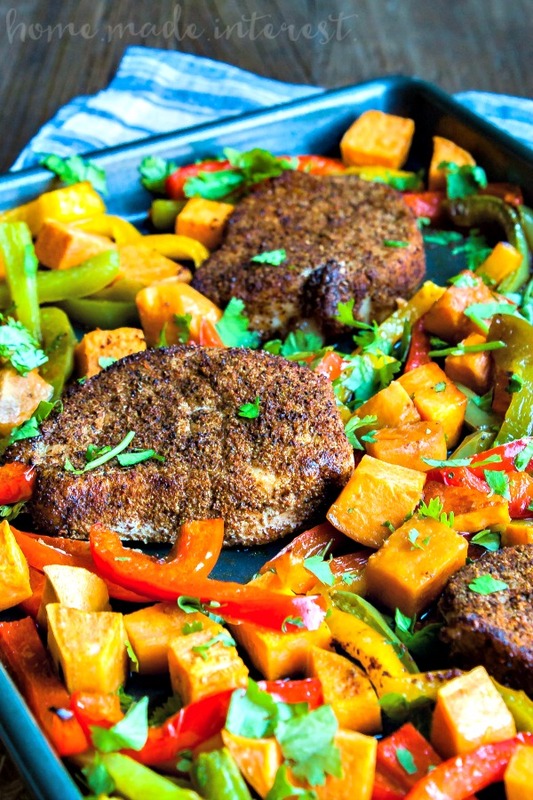 However, this Sheet Pan Spicy Pork Chops and Sweet Potatoes might be my favorite! 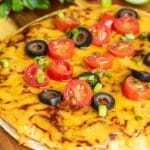 It’s got bold flavors mixed together with the sweetness of bell peppers and sweet potatoes. The whole meal comes together in about 45 minutes (faster if you have the veggies prepped!). The whole reason I started trying out sheet pan meals was to help simplify my life during the week. 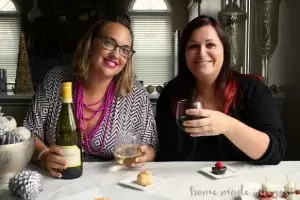 I wanted to make better food choices and realized the easiest way to do that is to cook my own meals, but who wants to spend a couple of hours in the kitchen cooking right after getting home from a long day at work? My resolution was to start doing my grocery shopping and meal prep on the weekend, and it has really made weeknight cooking so much easier. In the spirit of keeping things simple, I downloaded the Food Lion mobile app (Food Lion Mobile App – iTunes or Food Lion Mobile App – Google Play ). Food Lion has had an app before, but it has been completely revamped and now includes lot of features and capabilities that make it easier to shop and save at Food Lion. You can store your MVP card digitally and scan through digital weekly ads, coupons, and recipes. Everything is right there on your smart phone whenever you need it. 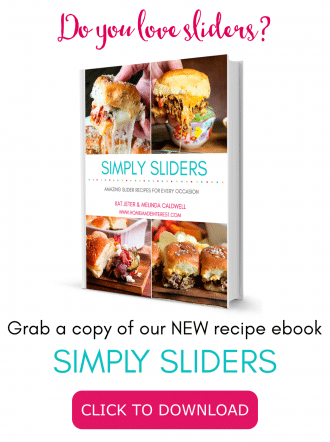 You can even use their Recipe Finder to search for recipes based on your ingredients. So far two of the mobile app features tie for my favorite.I’m not an expert couponer, so I appreciate that the coupon feature allows me to search for digital coupons using keywords and load them straight onto my MVP card. I can even sort by value, expiration date, and more! It has made couponing so much easier for me. Then there’s the shopping list feature. I’m going to admit something to you; I’m a little OCD about making shopping lists. I always list out everything I need and then go back through my list and group by category and where stuff is in the store. –While this is really useful,it is kind of time consuming. Now, with the shopping list app I can browse the weekly flyer, coupons and recipes and add whatever I need with a tap. I can track what items have MVP savings or coupons and I can even sort items by aisle!! Seriously, this is a total time-saver for me and I’m a little obsessed with it. Having my shopping list in the app is also pretty handy because I can update it any time I think of something new to add. Now when I get to Food Lion on a Saturday afternoon I can get everything I need to make dinner for the week, including amazing fresh and affordable ingredients, like the pork chops and vegetables I used for my sheet pan spicy pork chops and sweet potatoes. With these features, I am able to get out of the store in under an hour. Then, I just prep the meats and veggies on Sunday and all week long I can throw ingredients together, pop them in the oven and end up with a beautiful and delicious weeknight meal. If I’m lucky I have leftovers for lunch the next day! This Sheet Pan Spicy Pork Chops and Sweet Potatoes is full of big flavors and makes a bright and beautiful weeknight dinner. Add vegetables to a bowl, drizzle with olive oil and toss the vegetables to coat. Sprinkle with salt. Combine the chili powder, cumin, and salt in a small bowl. Rub pork chops with spices and place on baking sheet with vegetables. 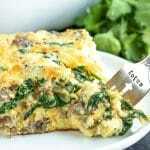 Bake for 25-30 minutes or until pork is fully cooked and potatoes are tender. 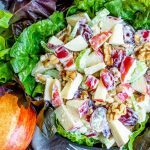 If you’re looking for more recipe ideas make sure to check out Food Lion’s Fresh Ideas Blog for all sorts of useful recipes and tips!